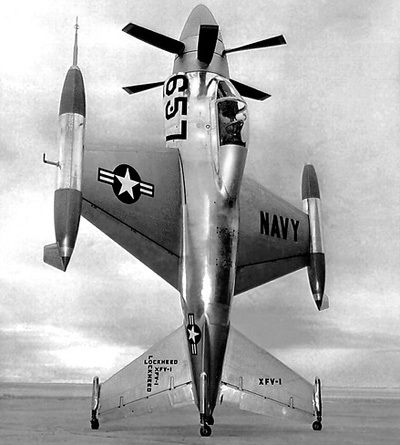 The Lockheed XFV-1 was a 'tail sitter'. This was the nickname given to some of the research aircraft of the 1950s which were the first to experiment with VTOL (Vertical Take-Off and Landing). It was hoped that in the near-future similar aircraft could be carried aboard Naval vessels other than aircraft carriers. Tail sitters, as the name suggests were designed to sit vertically on their oversize tailfins, and take-off and land in this orientation. 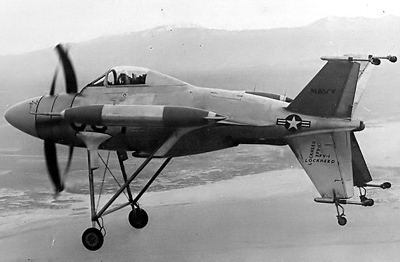 The XFV-1 first flew in March of 1954, piloted by Herman 'Fish' Salmon. 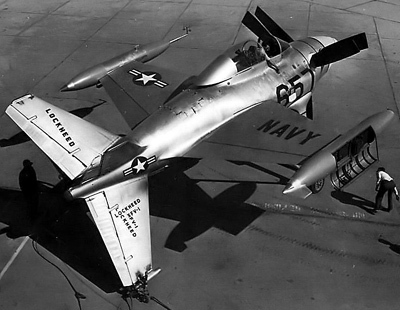 During the XFV-1 project he was to be the sole test pilot - hence the unofficial 'Salmon' designation for the aircraft. Despite the theoretical ability to take-off vertically, during all 32 test flights the XVF-1 used a clumsy fixed undercarriage because the VT40 contra-rotating turboprop was not considered reliable enough for the stresses of a vertical take-off, transition to horizontal flight and a vertical landing. The transition to vertical flight and back to horizontal flight was however accomplished a few times during test flights. 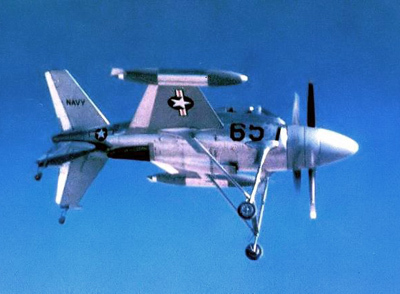 Due to the immense amount of skill required to fly the XFV-1, the US Navy soon realized that the aircraft was completely impractical for operating in anything other than perfect conditions - and even then only in the hands of the most experienced of pilots. The project was canceled only one year after the Lockheed XFV-1 first flew.